Το Baledatu Bungalow είναι μια πολύ καλή επιλογή για τη διαμονή σας σε Lombok, είτε είστε τουρίστας είτε επαγγελματίας. Σε απόσταση μόλις από το κέντρο της πόλης και από το αεροδρόμιο, αυτό το 1 αστέρων ξενοδοχείο προσελκύει αρκετούς ταξιδιώτες κάθε χρόνο. Με την βολική του τοποθεσία, το ξενοδοχείο προσφέρει εύκολη πρόσβαση στους προορισμούς της πόλης που πρέπει οπωσδήποτε να δείτε. Επωφεληθείτε από ένα πλήθος ασυναγώνιστων υπηρεσιών και ανέσεων σε αυτό το ξενοδοχείο της Lombok. Κατά την διαμονή σας σε αυτό το υπέροχο ξενοδοχείο, μπορείτε να απολαύσετε τα 24ωρη υπηρεσία δωματίου, δωρεάν WiFi σε όλα τα δωμάτια, 24ωρη φύλαξη, 24ωρη ρεσεψιόν, ασύρματη σύνδεση Wi-Fi σε δημόσιους χώρους. Όλα τα καταλύματα διαθέτουν τις απαραίτητες ανέσεις για να εξασφαλιστεί μια ασυναγώνιστη αίσθηση απόλαυσης. Εξάλλου, το ξενοδοχείο διοργανώνει πολλά ψυχαγωγικά δρώμενα έτσι ώστε να έχετε πολλά πράγματα να κάνετε κατά τη διαμονή σας. Ανακαλύψτε ένα ευχάριστο μείγμα επαγγελματικών υπηρεσιών και μια μεγάλη ποικιλία ιδιαίτερων χαρακτηριστικών στο Baledatu Bungalow. The location is a bit far from the main beach, but really close to sunset point. We like being away from the noise and appreciated the quiet atmosphere here. They offer free bicycles to their guests, which we loved so we could explore the entire island at no additional cost! The pool is great for a quick dip to cool off. The staff go out of their way to help you and even play music for you in the evenings on their guitars. We loved the shower, best one we've had this entire trip and really good pressure and HOT water. That is rare given the price. Would stay again for sure! I really loved my stay at Baledatu bungalows! I really enjoyed the location of this hotel, even though it is not close to the pier, it is in the middle of the islands which makes it close to both beaches. Bikes are available for free, which is super nice. The room was really comfortable and breakfast was good. The best part of this hotel is the people!! I feel I made new friends and when I left they sang me several songs, which was soooo nice! Small bungalows with nice and friendly staffs. We had an early check in, the room wasn't ready yet. The staff made us orange juices for our refreshment while we're waiting. And that was something real nice. Hotel location is a bit far from the beach, and surroundings are very dark at night. But it doesn't really matter, since Gili Trawangan seems safe place for tourist. If you want also relax and not being on the beach in a party mile I can recommend this place. Very friendly. Only the order of my hourse taxi did not work. I have asked one day before to organise but after asking in the morning they ordered and of course it did not work out. So be please be prepared to walk with your luggage to the harbour, The pool was realy refreshing. Staff is top notch, Mas Alan and Mas Mickey are here for your needs, very friendly, very good value for money as well, will defo go back and recommend it as well. See you soon guys! When we arrived we noticed that we were among the only guests in the complex. As a result of this staff were only present to assist us when we checked in. We waited about 30 mins for someone to show up regarding our complimentary breakfast but this never happened. I realise this isn't peak season but that doesn't mean your only guests should suffer as a result. Also the pool looked as if it had not been cleaned in weeks. The room had exposed wires, the curtain pole was hanging off and the linen and towels had holes in them. Very disappointing!! Three really great guys, who run the place. We hit it of right away!! !They entertained us with their music, since they are a band and good with their guitars. We just sat with them when we arrived and started to sing. They were very polite and friendly and really wanted us to feel at home.The place was a 15 min walk from The harbour. I would recommend horse taxi If you have big bags with you. The roads are not fully built and instead it was sandy roads. Which doesn't make it easy with bags. The place have complimenatary bicycles to borrow for free, which is great! I would definitely stay here again, had alot of fun with them. They dont have so many rooms, but still made room for us when we wanted to stay an extra night, so nice. We got friends for life, and i hope i'll meet them again! Staff were friendly and helpful. Food and drink relatively cheaper to convenient stores around the island so that's really important. However the bungalow is really distant from the harbor hence be prepared to walk under the scorching sun. Do Not carry huge luggages especially those with wheels. We stayed for 3 nights and the service was great. Didn't expect breakfast to be anything special, but was pleasantly surprised. The only thing is it's hard to get around anywhere since it's quite in the heart of Gili Trawangan. I'd recommend riding a bike, but it gets really dark at night. But for the price, I really can't complain. If you're on a budget, don't mind walking, and want an awesome friendly service, go here. Once you arrived, I suggest you to take cidomo (horse train) instead. bc it's located nearly in the middle of the island, 1.2km from the main jetty, it takes us 20-30 minutes by walk. I've booked 4 rooms for one night. Rooms are very clean, and bathroom were good too. Staffs are very fiendly and informative. Pros: This place is a short walk from the main harbor and easy to find. The rooms have high ceilings and are spacious. The beds are new and comfortable. The bathrooms are clean with nice showers and good lighting. Cons: pool is really small with no lounging area. There are a few bean bag chairs though. The a/c units aren't very powerful and don't make a big difference during the day. We loved BaleDatu and extended our stay there! The staff was super nice and helpful! Breakfast and bikes are included which was a huge bonus. What really sold us was its cleanliness! Really great value for its price. A little out of the way but the seclusion was nice because it was quiet. 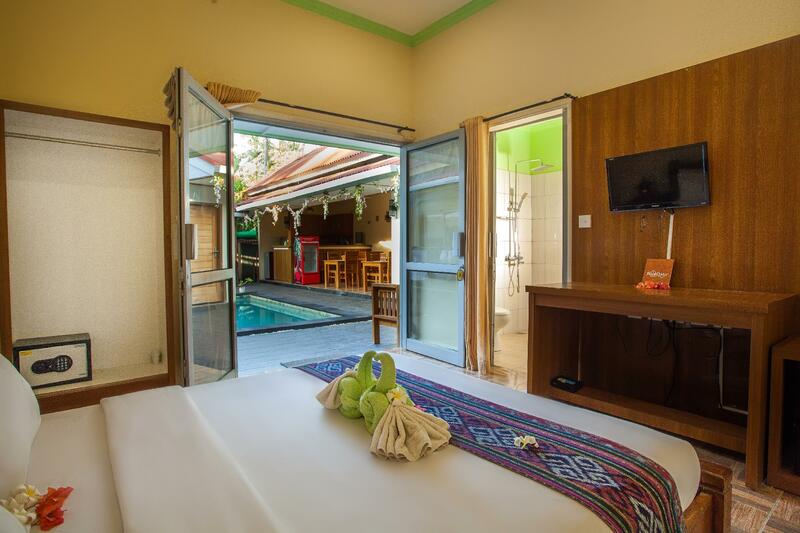 Eventhough its prety hard to find this place, this is a recommended hotel when you're in Trawangan. Reasons: Super friendly staff and the journeybfor you to reach this hotel. Hotel was new and good. Love their shower and their small pool. Free bicycle for you to go to the main street too. And breakfast. . . Is gooding! Since its prety safe here, you can just wall or cycle to the main street easily eventhough it is dark! Me and my girlfriend had a wonderful stay here. The staff is super friendly and can help you with booking snorkeling trips, or showing you places around the island. Breakfast was good (I recommend the banana pancakes), and the facilities (rain shower, pool, airconditioning) were very good in comparison to the price. Overall a very nice stay. The guys at Bale Datu were so friendly from the moment we arrived. Room was clean and the facilities (international tv, fridge, air con) worked really well. Free bikes were a plus although in need of a service maybe but free is free! Liked that this is about a 10 min walk from the hustle and craziness of the Gili t main strip. Definitely recommend !